Cruise down the River Thames and learn about London's top landmarks with the London Eye River Cruise expert guides. Discover London’s main riverside attractions by boat with a 40-minute circular Thames River cruise. - Please go to the London Eye Pier 15 minutes before the time shown on your e-ticket. - Strollers or heavy luggage are not allowed on The London Eye. Discover London’s main riverside attractions by boat with a 40-minute circular cruise in the Thames. Our cruise features live commentary presented by expert guides that bring the city to life. Audio commentary is also available in French, German, Spanish, Dutch, Italian, Russian, Japanese and Mandarin. You’ll witness the city’s great contrasts as you pass historic sites such as Big Ben, St. Paul’s Cathedral and the Tower of London, and contemporary landmarks like the Tate Modern and the sleek Millennium Bridge. 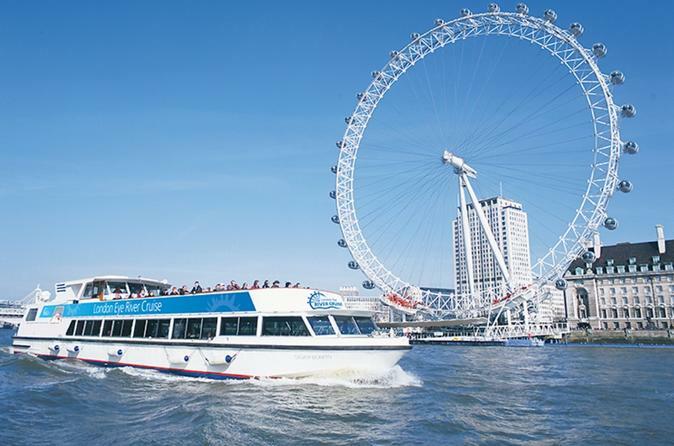 Your fun sightseeing cruise departs throughout the day from the London Eye. Make your way to London Eye Pier and board the all-weather boat for a cozy ride in winter, or a breezy ride on the open-air deck during the lovely summer months. Enjoy interesting live commentary as you glide past Westminster’s iconic Houses of Parliament and Big Ben, followed by St. Paul’s Cathedral, Tower Bridge, the formidable Tower of London and more. Your 40-minute river circuit returns to the departure point at the London Eye. Timed entry as per selected, exact admission time will be confirmed at checkout and on the voucher Please go to the London Eye Pier 15 minutes before the time shown on your e-ticket.